Brownshirt's Canterbury Earthquake Recovery Authority is another blot on the same stained Action Man bedsheets as his other wet dreams, in particular the abolition of the democratically elected Canterbury Regional Council so that the water aquifers can be drained by the dairy farmers without the hassle of meddling townies. Is CERA really necessary? It looks to be something of a slap across the face for Bob the re-builder and his Christchurch City Council. The City Council already covers all the quake-damaged area and holds those responsibilities. The City Council delivers public works, co-ordinates infrastructure etc., and covers the brief of reconstruction, surely. How can the addition of more centralised, executive-style control over what is essentially other people's projects and interests be more efficient or more equitable? Why would a CERA plan over-ride or countermand a CCC plan or operation? 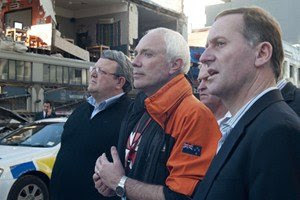 Earthquake Recovery Minister Gerry Brownlee says the establishment of the Canterbury Earthquake Recovery Authority (CERA) will provide leadership and coordination of the recovery effort following the February 22 earthquake. Mr Brownlee said CERA would have wide powers to relax, suspend or extend laws and regulations which would be used responsibly and for clearly defined purposes related to earthquake recovery. And it's all based on what occurs in Australia - the most bloated and over-layered bureaucractic form of governance known to humanity. Mr Brownlee said many of powers in the proposed CERA legislation, which will be introduced to Parliament in the coming weeks, were based on those put in place when establishing the Queensland Reconstruction Authority following the state’s devastating floods in January. Functions relating to working closely with affected communities and collecting and collating information about infrastructure and other property, and community services, come from the Queensland Reconstruction Authority Act 2011. Powers that relate to CERA’s ability to acquire, hold, deal with and dispose of property and the Minister’s ability to call-in the powers and functions of a local authority or council organisation are also based on those outlined in the Queensland Reconstruction Authority Act. Is it some anonymous acronymed government body that will erect the New Babylon from the dust of this Revelationesque apocalypse? Under its authority Brownlee's bulldozers will raze the CBD and beyond. The only thing going for Christchurch was the Victorian structures and these are being hastily torn down in the same way everything is being hastily torn down. The most likely scenario is that the darling gargoyles of Cantabrian architecture - and also the least inspired - Warren and Mahoney, will be given free reign amid the demolition to create a horrid, windswept, sharp-edged, monotonous, right-angled, grey concrete dystopia in their brutalist style. Far from being Bob the Parker's optimistic opportunity to create a beautiful 21st century city, it could be the worst rebuild imaginable if those draftsmen have any input.